Tag Ink & Thread is a small, family owned business dedicated to helping you impress with your custom apparel or promotional products. We might be new in town, but when it comes to custom apparel and promotional products, our staff has incredible expertise and over 60 years of combined experience. Our two on-site graphic designers and expert production staff are here to bring your ideas to life. Our motto, With TAG, You’re It! is more than just a saying to us. It’s our philosophy. We believe that every order is just as important as the next, no matter the size or the customer. We want to ensure that every product that leaves our store looks great, and every customer leaves happy. 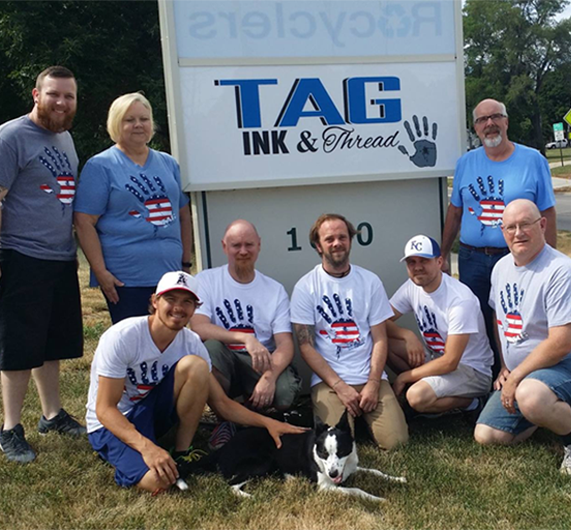 Our mission at TAG Ink & Thread is to provide each and every customer with outstanding customer service and high quality work with a quick turnaround at competitive prices. Every employee at TAG is equipped with the industry knowledge and experience to help serve you in the best way possible. Whether this is your first experience with screen printing or you’ve done it a thousand times, our staff will work with you to ensure the best experience possible.